Luke's Bespin outfit always looks more grey-green than the tan color that Hasbro keeps making him. 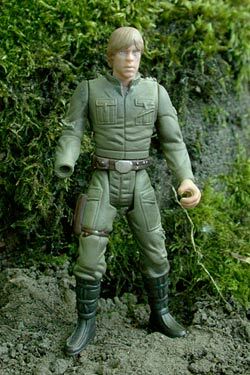 I wanted this repaint to reflect the fatigued, sans hand, post-duel Luke. I painted him grey-green with darker "sweat rings" under his arms and around his neck. His left shirt pocket is molded as torn, so I added a few more rips and tears.